Alligator snapping turtles live in deep water in rivers, lakes, canals, swamps or bayous. Although they are only two to three inches in size when they hatch, these turtles can weigh in at 150 lbs. when fully grown, making them the world's largest freshwater turtle. The large size and appetite of the alligator snapping turtle can make caring for it difficult. Alligator snapping turtles should not be cared for by inexperienced turtle owners, or by experienced owners who lack sufficient space. Keep this in mind when contemplating adoption of a hatchling. Select an enclosure for your turtle. A glass tank, stock tank, plastic tub or pond work well. A hatchling requires at least a 20- to 50-gallon enclosure. Fill the tank with water that is at least as deep as two times the turtle's length. Place plenty of obstructions in the water to make the turtle feel secure. Examples of obstructions include driftwood, stones, logs and stumps. Set up a filtration system for the tank. For smaller tanks, canister filters are available. Canister filters sit outside of the tank. You place one hose at the bottom of the tank that pulls water from the tank into the filter, while another hose sits in the tank to return filtered water to the habitat. These filters can be cleaned by rinsing the canister every two weeks. A variety of pond filters are available. Each is installed and maintained differently, but a good way to choose a pond filter is to select one with a gph (gallon per hour) filtration that is double the amount of water the pond holds. For example, a 200-gallon pond requires a 400 gph pond filter. Place a submersible heater into the enclosure that corresponds to the amount of water your enclosure can hold (for example, a 50-gallon tank requires a unit that heats 50 gallons of water). Set the heater to keep the water at a constant 75 to 80 degrees Fahrenheit. Create a basking area by placing a log, a piece of driftwood or a stone large enough for the turtle to get completely out of the water and stretch out on. While basking is uncommon in alligator snapping turtles, this allows the turtle to dry off if it desires. For an indoor enclosure, set up a full-spectrum UV lamp (also known as a clamp lamp) on the side of the tank over the basking area. The lamp recreates the sunlight your alligator snapping turtle would bask in if it lived in the wild. The temperature of the basking area should remain a constant 80 to 90 degrees Fahrenheit. Allow the equipment to run for 30 minutes to three days to ensure it functions properly. If everything is working properly, introduce your turtle to the enclosure. Feed your hatchling turtle daily in its own tank. Allow the hatchling alligator snapper to eat as much food as it can in an hour's time, then scoop out any remaining food to keep the tank as clean as possible. Offer a complete diet including commercial turtle food, meats and vegetables. For suggestions of foods to offer, look at the tips section of this article. Alligator snapping turtles grow quickly and become very large. When selecting an enclosure, keep in mind that you will have to upgrade constantly as the turtle grows, and at full adult size these turtles require at least an 800-gallon pond or stock tank. Purchase the largest tank you can afford for your turtle. You can purchase a reptile thermometer in pet stores to gauge the temperature of the land and water in your turtle's habitat. Alligator snapping turtles are not usually a social animal in the wild, meaning they do not generally live with one another. That said, alligator snapping turtles are best kept alone but can be kept with other species of turtle as long as the turtle is the same size as (or larger than) the alligator snapping turtle. 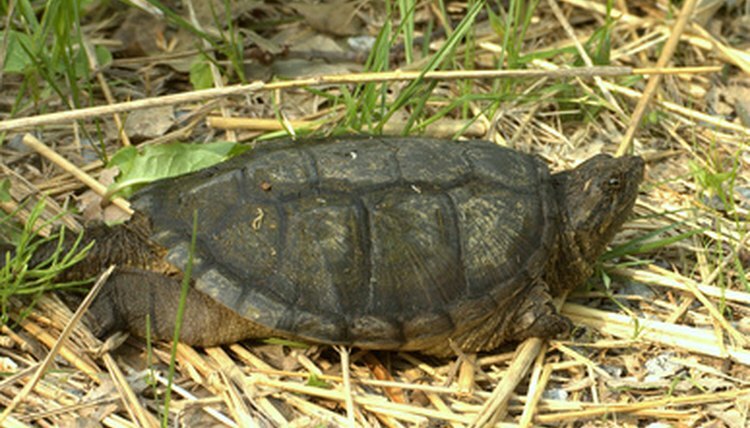 Commercial turtle food can be purchased in most any pet store or online. Examples of meats to offer include live guppies or freshwater minnows, crayfish, cooked chicken, chopped bluegill, bass or game fish. Vegetables and fruits to offer include water lettuce, grapes, cherries, bananas, apples and carrots. Alligator snapping turtles are, literally, snapping turtles. They can and will bite you. Exercise caution when caring for this type of animal.